By Donagh Corby | March 21, 2017. Former Wales international John Hartson was in Dublin on Sunday night to pick up the gong for “International Personality” at the FAI Awards. With less than a week to go to the big game, The Liberty got to catch up with the Celtic legend to talk about the match. “It’s a little bit awkward for me [being at the FAI Awards], because I’m the only Welsh man in there,” said the former player. “I appreciate we’ve got the big game on Friday… It’s imperative that Wales don’t get beat. I think if we lose on Friday then all of a sudden the gap between Wales and qualification spots is seven points and that would be very difficult for us to claw back. Hartson appreciates the incredible start the Boys in Green have had to the World Cup Qualifying Campaign, which has included an away draw with Serbia and massive wins against Moldova and Austria. “The Republic of Ireland have had some tremendous results so far, especially with the three games away from home. The win in Austria was remarkable. To what does the former Wimbledon star attribute this poor start to the campaign for Wales? “We just haven’t been seeing games out. 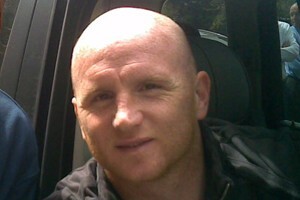 Hartson then sang the praises of Welsh legend Gareth Bale, and highlighted his importance to the team on Friday. “He’s special. He’s won two Champions Leagues in the last three years. When Zinedine Zidane says you have to tie this guy down to a long-term deal and that he’s the most important player now at Real Madrid well then that tells you something. “He’s explosive, like a Ferrari. He’s incredible. It’s going to be intriguing watching him going up against Seamus Coleman, who is a great talent who never wastes that ball and works so incredibly hard. It’s going to be a great battle. I wonder if Martin [O’Neill] is going to play Jeff Hendrick or Glenn Whelan against Ramsey in the middle of the park.